UL claimed a second consecutive O’Connor Cup as they ran out 16 point winners over DCU in the final at Cork IT last Saturday. Two second half goals from Aine Tighe were enough to put daylight between the sides and after amassing a sizable lead early after the restart, DCU always looked in trouble. After a hard fought victory against UCC the previous day, DCU looked visibly drained during a very physical encounter with the Limerick college. UL rushed to an early 0-4 to 0-1 lead, Roisín Leonard opening her account with two points early on. DCU drew level with scores from Lorraine O’Shea, Carol Hegarty and Sarah Rowe. However, DCU suffered the first major blow of the afternoon when UL were awarded a penalty following some slack defending. A fine save from Aisling Tarpey denied Caroline McCarthy, but after the ball was handled on the ground, Leonard made no mistake from the penalty spot. McCarthy and Leonard were a continuous threat throughout the first half and added to their tallies bringing the game to 1-9 to 0-6 at the break. Anna Galvin slotted over at the games resumption to extend the Limerick side’s lead and after DCU’s Bríd O’Sullivan forced a good save from Edel Murphy, UL put the game beyond doubt. Tighe again popped up in the UL forward line and rifled her shot into the top corner, leaving Tarpey no chance. Whatever flicker of hope DCU had of a comeback was extinguished just five minutes later when Tighe side stepped the keeper and found the net yet again. 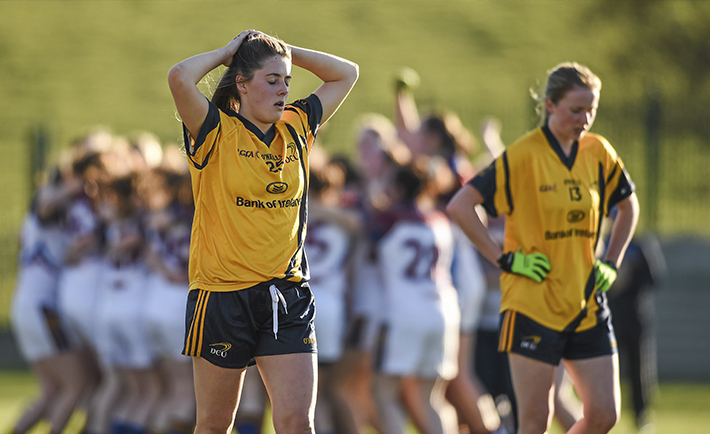 The full forward benefited when Niamh O’Dea’s shot fell kindly into her path and kept a cool head to put the defending champions out of sight. A gulf of class and an insurmountable lead effectively killed off the game with 15 minutes of the game remaining. Rowe rounded off the scoring for the day, but the damage had already been done and UL celebrated another well-deserved O’Connor Cup victory. UL: Edel Murphy (Kerry); S Condon (Tipperary), L Ryan (Clare), B McManus (Cork); C Cooney (Galway), N Richardson (Limerick), J White (Cork); L Scanlon (Kerry), J Grant (Tipperary); A Wall (Waterford), A Galvin (Kerry), A Tighe (Leitrim); C McCarthy (Kerry), N O’Dea (Clare), R Leonard (Galway). Subs: C O’Sullivan (Kerry) for McCarthy (40), E Buckley (Tipperary) for Cooney (45), A Considine (Clare) for Condon (49), S Everard (Tipperary) for Leonard (52), Elaine Murphy (Mayo) for Edel Murphy (53). Scorers: Á Tighe 2-1, R Leonard 1-4 (0-2f), N O’Dea 0-3f, A Wall, C O’Sullivan 0-2 each, A Galvin, C McCarthy, L Scanlon, J White 0-1 each. DCU: A Tarpey (Mayo); A Bell (Mayo), L Caffrey (Dublin), S Greene (Cavan); L Collins (Dublin), D Murphy (Dublin), K Murray (Dublin); C McManamon (Mayo), L O’Shea (Tipperary); B O’Sullivan (Cork), L McEnaney (Monaghan), S Woods (Dublin); C Hegarty (Mayo), L Peat (Dublin), S Rowe (Mayo). Subs: E Rutledge (Dublin) for Hegarty (37), A O’Reilly (Dublin) for McManamon (47), L Fleming (Roscommon) for O’Sullivan (52), G O’Loughlin (Sligo) for Collins (56). Scorers: S Rowe 0-4 (0-1f), C Hegarty, L O’Shea 0-2 each, B O’Sullivan 0-1.